How did you get into the sport of dragon boating? Jim Thaxton, a friend of mine through our mutual work in the field of education, approached me regarding a team he was forming based on a grant application of his. I’m not a very good swimmer and in fact had a fear of water. Jim still thought I would enjoy it, and there were other people I knew that were joining the team as well. From the first moment I got on the boat it was addictive. I’ve been a part of the team since then, right from the onset. What is your favorite memory in the sport? 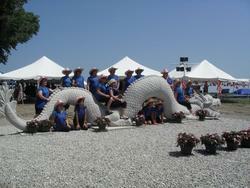 Two years ago, the team traveled to Windsor, Canada to compete in their International Dragon Boat Festival. We actually ended up being the Champion in our division, which was quite a surprise to all of us. More recently, last year, for the festival we host near Alexandria, we presented St. Elizabeth Healthcare with a check for $10,000 from the proceeds of that event. This charity promotes cancer awareness and helps ladies that cannot afford mammograms to get one to increase the likelihood of early detection. 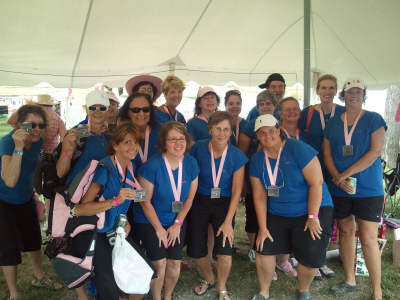 All the paddlers on our team are Breast Cancer Survivors, and I am now a 10 year survivor. It was early detection with a mammogram that helped me find out what happened to me. I’m a retired school assistant principal now, but I did not miss one day of school while going through chemotherapy and radiation treatments. What's the most rewarding aspect of the sport for you? The camaraderie of being part of a team and being associated with a team that truly understands what cancer is and how you battle it. Just being together as a team, with the closeness, we consider ourselves sisters in the boat. We all carry such meaningful relationships on our team, the Kentucky Thorough-Breasts. Have you traveled anywhere with the team? Where to? In the past, we’ve traveled to Windsor, Canada (three times), Cleveland, Orlando, and Atlanta. For this year, we know we’re heading to Akron, Ohio, in July and Montgomery, Alabama, in June. We might go to one or two other events as well. Would you recommend the sport to other Breast Cancer Survivors? Absolutely. it’s an amazing workout, it gets your heart pumping. It’s definitely strengthens your upper body. It promotes good health. On our team our youngest team member is 24 and our oldest is 78. It doesn’t matter what age you are. I do recommend it because it’s great exercise, and I think this sport enables you to be the best you can be. There’s nothing more peaceful than when we’re on the water at the park we practice at. It’s good for your emotions, and good for your spirit. Paddling with other people that have gone through a similar experience is also meaningful because all the teammates understand what cancer is. The key to help you get through it is with the help of God above, family and friends, and you must remain positive. Phyllis Kelsch is a member of the Kentucky Thorough-Breasts, a Breast Cancer Survivor team near Alexandria, KY. 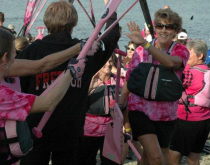 The Kentucky Thorough-Breasts are an affiliate of Paddling for Cancer Awareness, Inc. a 501c3 organization of Breast Cancer Survivors committed to Breast Cancer Awareness. The team was formed in 2008 and includes breast cancer survivors and supporters.